BALTIMORE — The Mount Vernon neighborhood of this city was for many years a haven for prostitutes and crack dens. But its residents, intent on fending off the drug scourge and high homicide rate that had infected many areas of Baltimore, joined together to turn their neighborhood’s prospects around. The city’s struggles have been compounded in recent years by poorly maintained public schools, protests following the death of Freddie Gray and problems in the police department, including the recent firing of the police commissioner and the resignation of his successor. 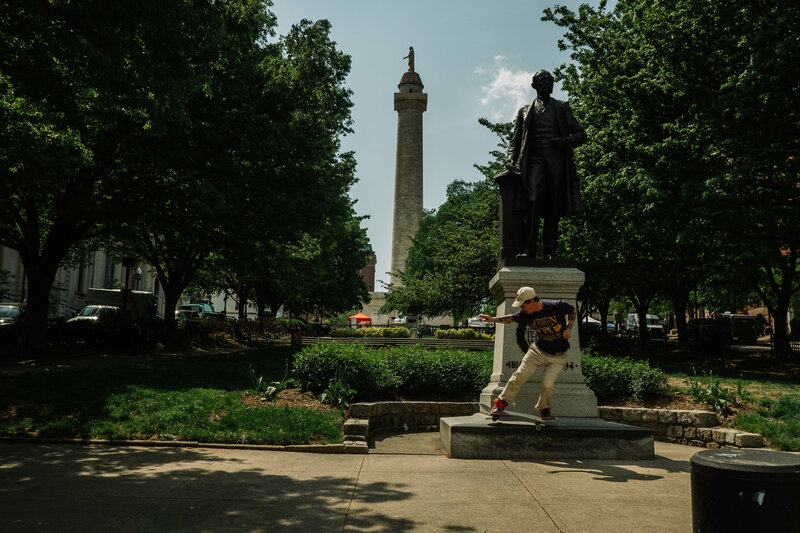 The residents of Mount Vernon, a historic area with once-elegant buildings more than 100 years old, have embarked on a determined comeback, focusing first on the neighborhood’s Washington Monument. The first major memorial to honor George Washington, the monument had been largely ignored for decades. “It was an underachieving asset for the city,” said Lance Humphries, the executive director of the Mount Vernon Place Conservancy. That began to change in 2008 when residents, supported by city officials, formed the conservancy to restore the monument and the four small parks that surround it. With the aid of $7 million in state, city and private funds, Baltimore’s Washington Monument reopened on July 4, 2015, the bicentennial of the laying of its cornerstone. Around the same time, Mount Vernon was beginning to come into its own. Through a well-organized neighborhood association, residents have retained substantial sway over how the community has developed. In the early 2000s, after a bruising fight with city officials, residents successfully resisted construction of high-rises, and have since been able to work with developers on projects that generally maintain the low-rise scale and complement the historic architecture. A neighborhood wine store, Spirits of Mount Vernon, was an early catalyst for the boom. It opened more than a decade ago in a building that a group of residents renovated by pooling about $600,000 of their own money and getting a $1.2 million loan. Since then, other business owners have taken note of the turnaround. Eddie C. Brown, the founder and chief executive of Brown Capital Management, has watched the neighborhood evolve. Mr. Brown arrived in Baltimore 1973 to work for T. Rowe Price. Ten years later, he founded his investment management firm and moved it to refurbished office space in Mount Vernon. His firm has since expanded to several adjacent buildings. When a city-owned former mansion in Mount Vernon caught his eye, Mr. Brown decided to expand his portfolio. “The quality and history of these buildings is just incredible,” he said. Three years ago, he opened the Ivy Hotel, where rooms can cost $600 a night, with a spa and the upscale Magdalena restaurant. Another entrepreneur, Dennis Richter, immigrated to Mount Vernon with his mother from Germany in 1987 when he was 14. After spending the past decade buying small properties and turning them into apartments and a coworking space, he is planning a $40 million mixed-use development. His project would add about 120 apartments and about 15,000 square feet of commercial space in the heart of Mount Vernon. “There is so much room here, so much opportunity to add to great density without having to displace anybody,” Mr. Richter said. He added that he hoped to lure a grocery store to the ground-floor retail space and build a rooftop pool and dining area. Other recent projects in the neighborhood include the conversion of a former fur storage warehouse into apartments; construction of the Varsity, an 11-story apartment building that provides student housing; and transformation of a firehouse into a brewery and pub. Mount Vernon’s turnaround has helped draw outside developers and investors. The Hotel Revival, a midprice boutique hotel in a renovated building overlooking the Washington Monument, opened in early May. The hotel was developed by NuovoRE of Denver and financed by Alice Walton Proietti, a granddaughter of the Walmart founder Sam Walton. Ms. Walton Proietti’s sister-in-law Tracy Proietti lives in Mt. Vernon and headed up the project. Ari Heckman, a Brooklyn-based developer, also has Mount Vernon in his sights. He hopes to arrange financing to open a hotel at the Latrobe, a former single-occupancy residence built in the early 20th century that became an office building. Much of the recent building boom has been residential, but a few commercial projects have brought some chain stores and a medical cannabis dispensary. When SBER, a developer based in Baltimore, opened a residential and commercial development about 10 years ago, it included a Starbucks and later a Chipotle. Others might find the arrival of chain stores disconcerting, but Mount Vernon residents took it as a sign that retailers thought the neighborhood had potential. Since then, more coffee bars and restaurants have sprouted up, as business owners were lured to a neighborhood that includes tourist draws like the Washington Monument, the Walters Art Museum, the Joseph Meyerhoff Symphony Hall and the Center Stage Theater. Mount Vernon is within walking distance of Baltimore’s business district and Inner Harbor, and an Amtrak station lies about 15 minutes north. City officials and Amtrak are discussing ways to overhaul the aging station to include a major commercial development. The neighborhood also counts among its assets the Maryland Institute College of Art, the University of Baltimore and its law school, and the Peabody Institute. Steve Shen, a former engineer and banker, has lived in Boston, Chicago, Hong Kong and New York. But for the past 16 years, he has called the neighborhood home, attracted to the large brownstones, former mansions and a walkable neighborhood. Mr. Shen, who has worked with his neighbors over the past few decades to preserve height limits and retain a sense of scale, is happy to see more density. He eagerly welcomes new residents and the growing number of small shops, coffee bars and restaurants, as well as a children’s park and a dog park. A version of this article appears in print on May 16, 2018 , on Page B4 of the New York edition with the headline: Helping Their Neighborhood Look Like Its Old Self Again.